If you've been looking for a natural, chemical-free way to keep your skin looking radiant and healthy, Reserveage has you covered. 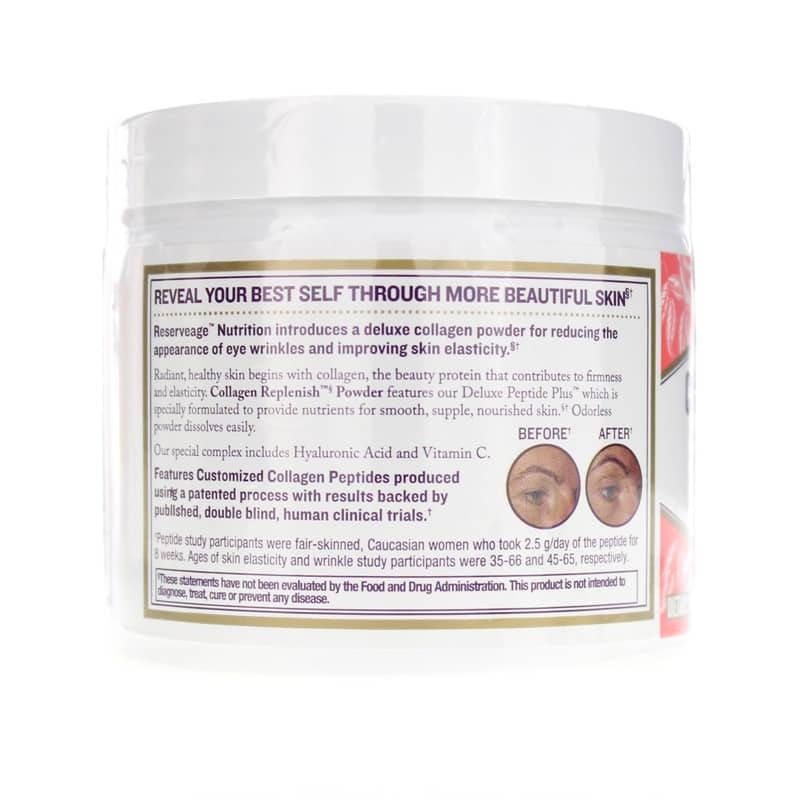 Collagen Replenish with Hyaluronic Acid & Vitamin C is a simple powdered mix that supports the slowing of collagen deterioration and free radical attack to keep your skin beautiful. 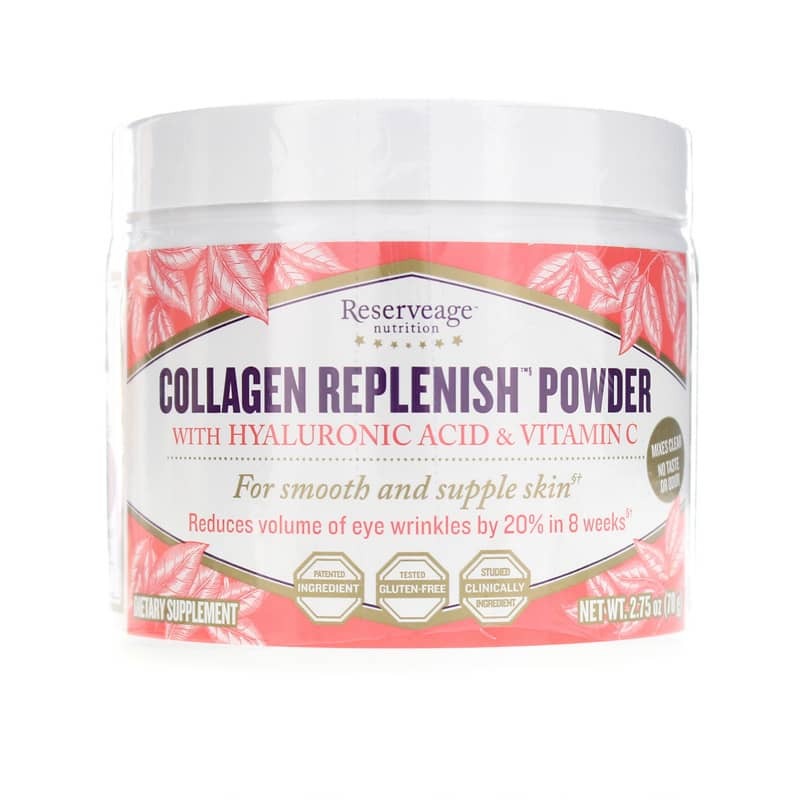 Collagen Replenish with Hylauronic Acid & Vitamin C from Reserveage Nutrition is formulated with non-GMO ingredients, is gluten-free, and contains bioactive collagen peptides to aid your body in the absorption of the nutrients. It's a quick solution to helping keep your skin beautiful. Just mix a scoop into water or your favorite juice! Plus, you won't have to worry about any unpleasant aftertaste. Collagen Replenish is tasteless! It's also free from the most common food allergies. Keep your skin beautiful and radiant. Choose Collagen Replenish with Hyaluronic Acid & Vitamin C from Reserveage Nutrition to replenish vital proteins for optimal collagen production and skin health. Try it today! 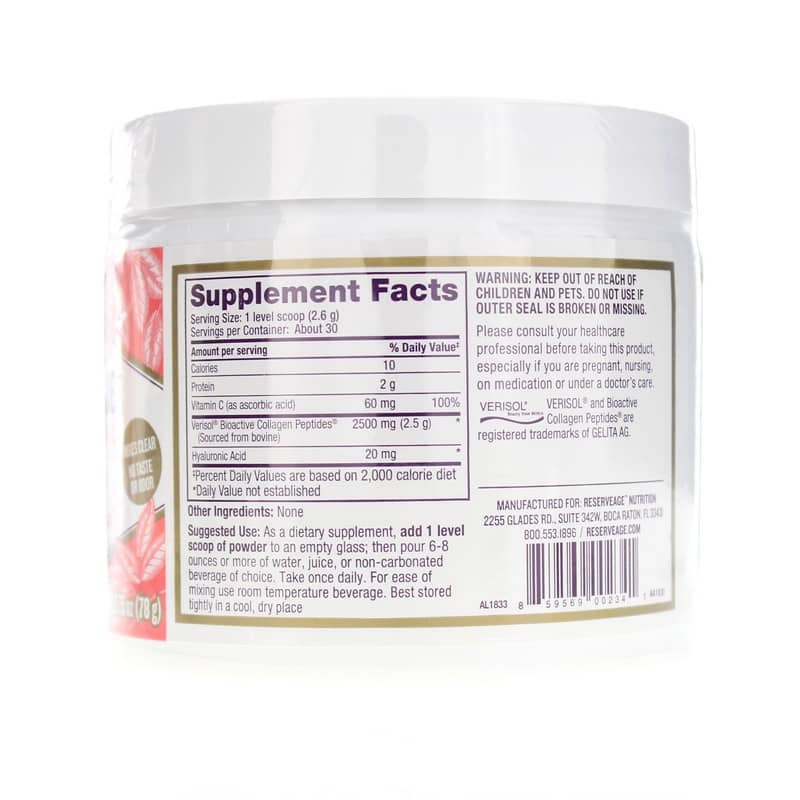 Contains NO: gluten, corn, soy, wheat, yeast, lactose, citrus, milk, egg, fish products, sugar, salt, starch, artificial coloring, flavoring, preservatives or GMOs. Adults: As a dietary supplement, add 1 scoop to an empty glass, then pour 6 to 8 ounces or more of water, juice or non-carbonated beverage of your choice. Can also be mixed into yogurt. Take once daily. Do NOT use if you are pregnant, nursing, on medication or under a doctors care. Keep out of the reach of children. I really like this product. It works well for me. This stuff is great and no bad taste. This product seems to work. I noticed a difference in my skin. Easily dissolves, tasteless. Noticed an improved difference in my skin after a few weeks of using. I have just started taking this but it seems to working. I will keep taking it and see how much my skin improves. Great product. I can see results. I love this product. It dissolves quickly in water with no taste. I definitely see results. I started taking this to help with my skin but have noticed improvement with joint pain as well. I mix it in water every morning and it has no taste. Easy! I mix this in with my morning smoothie and am satisfied with the results. I have been using this since summer, and bruising on my arms and legs has significantly lessened. Before my arm could just brush against a door frame or seat belt, and tearing and a raised, red-purplish bruise would appear. I am so grateful my sister recommended this product and company!